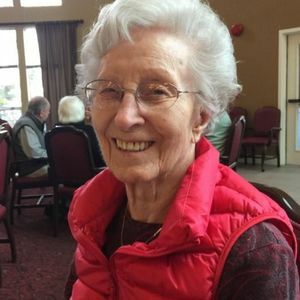 Dorothy Jeanne Sheneman Coverdell passed peacefully from this earth into the arms of the Lord on Sunday, March 11, 2018, at the age of 95. She was born on December 21, 1922 to Ralph E Sheneman and Lucy Maude Reed Sheneman, in Beaver City, Nebraska. She met and married her husband Don Coverdell in Polson, Montana. They spent most of their married life following his career in retailing, which moved them to various areas of the U.S.. She moved to Half Moon Bay from Lake Shastina, California in 2009 to be near her children. Dorothy was a precious woman of deep and sustaining faith and love. She was a woman who lived life to the fullest, always ready to help (anyone and everyone), always ready to GO (anywhere at any time). She was known best for her love for the Lord, her unfailing love for her family, and her bright and welcoming smile...the kind of smile that can only come from one's heart, and hers would light up a room. She had a brightness to her that children were always drawn to, as she was to them. She loved to serve in her church, bake, snow ski, water ski, golf, play tennis, bowl, take fast walks, knit, crochet, needlepoint, etc. Her hands and legs were seldom still. Dorothy was married for 57 years to Donald Ottman Coverdell, until his passing in 1999. Together they had, and are now survived by, 3 children and their spouses...Ron and Elizabeth Coverdell, Judy Coverdell, and Ken and Sally Coverdell. Dorothy is survived by her loving sister Donna Lewis and her brother and his wife Jack and Gloria Sheneman. She is also survived by 6 grandchildren and 8 great grandchildren... Daughter, sister, wife, mother, grandmother, great grandmother, friend...she will be greatly missed by all!!! The family wishes to extend their deep gratitude to Cedar Lane Care Home and Mission Hospice for their loving and professional care and support. Donations in memory of Dorothy can be made to Cedar Lane Care Home, PO Box 370055, Montara CA 94037. Add your thoughts, prayers or a condolence to Dorothy's guestbook.